Is tuna safe to eat? Ever since in 1970 mercury was discovered in a can of tuna, the threat of heavy metal overdose has loomed over tuna lovers. Let’s put some facts into the discussion: how safe is tuna? The other day I was at one of our local supermarkets and saw that they had my favorite brand of canned tuna on sale: first class albacore fillets, in water or olive oil. These usually go for €1.99, but they had them for €1.49 – almost a steal. I grabbed an entire box and, good son that I am, took out my cell to phone mom and ask if she wanted any, as I knew she liked to put the same brand on her salads or into sauces. But things turned out differently. “No,” she said, with a bit of contempt in her voice, “they are so contaminated and besides, all those dolphins!” I played dumb: “What about the dolphins?” “They get caught in the nets with the tuna fish”. My mother the eco warrior. The same woman who drives 20 miles to go shopping in the town she used to live in, because it’s “more familiar”, now worries about dolphins. I suppose the tuna being caught in the nets wasn’t a problem, as they had the bad luck of never having starred in a TV show. How about “Bluey the Tuna”? Then again I have no idea if you can get tuna fish to dance on their tails. But I’m digressing. Fact is that tuna do tend to be contaminated with a heavy metal, mercury. Largely methylmercury, to be precise. And mercury is extremely toxic; being exposed to low doses over longer stretches of time can result in tremors and impair hearing, seeing and the rest of your senses, not to mention your ability to think. At higher doses you look at chest pain, limited lung function and inflammation of lung tissue, muscle spasms, hallucinations, depression and many more. It’s the stuff nightmares, literally, are made of. This is certainly not what we want to eat and therefore have to look at a couple of numbers to find out if tuna is safe to eat or not: a) up to what dosis can humans avoid the above effects, b) how much mercury is in tuna, and c) taking both together, how much tuna can we safely eat over what stretches of time? What Exposure To Mercury Is “Safe”? Saying that exposure to mercury could be “safe” would be stretching it, so let’s say that up to a certain point the human body can cope with it without experiencing those unhappy effects above. This is called the “TDI” – the tolerable daily intake over a lifetime. For adults, the World Health Organization established this at a weekly 0.47 microgram per kg body weight (PDF), which is app. 0.22 per lb (1,000 micrograms = 1 milligram, 1,000 milligram = 1 g). Therefore, if you are a 160 lb adult (72.5 kg), you get away with 34.1 microgram (mcg) per week. How Much Mercury Is In Tuna? Now we get to where the meat, or rather, the fish is (depending on how you define “meat”). Different kinds of tuna have different mercury concentrations and this also varies with where the fish was caught. Interestingly, tuna caught in the Atlantic contains more mercury than those caught in the Pacific. 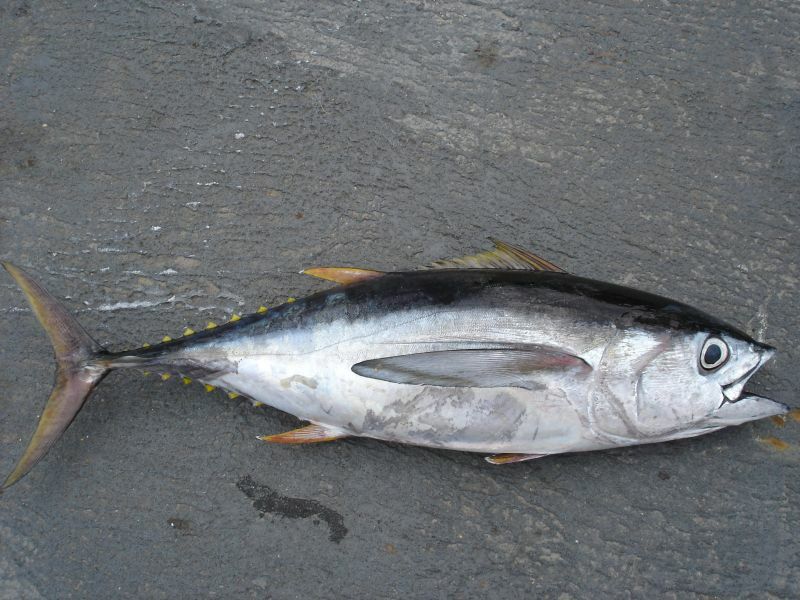 The bigeye tuna (Thunnus obesus). Nonetheless, if we average this and take the data the FDA has been accumulating in a monitoring program since 1990, we find that the contamination with mercury in “fresh / frozen” tuna is around 0.38 mg per kg, 0.35 in canned albacore and 0.12 in canned light tuna. Let’s calculate this into cans, the most popular form in which tuna is bought in: The average, regular can of tuna contains 172 g (~6 ounces). As 1 kg has 1,000 g, we have to divide above mg numbers per kg by 5.81 (1000 / 172) and then convert that to micrograms. For albacore tuna cans this gives us 60 mcg and for light tuna 20 mcg of mercury per can. The comparable amount of fresh or frozen tuna steaks comes in at 65 mcg. This of course provided that you don’t eat any other fish at all. Many fish are contaminated with mercury and some are way more than tuna (eg. swordfish who have 0.98 mg / kg, or tilefish, coming with 1.45 mg / kg). Therefore, if you eat fish in other forms than tuna, you would have to add that to your weekly mercury level. Also keep in mind that for children and pregnant women the above tolerable levels are only half of what is stated here. If you are a pregnant woman, you may want to stay away entirely from albacore tuna and eat less than a can of light tuna per week. If all this math is too much, check out the tuna calculator the Environmental Working Group put together, where you can enter your own data and then get a fairly accurate reading about how much tuna you should subject yourself to. So, is tuna safe to eat? In a way, mom was right: tuna should be eaten with caution. You may not entirely have to say no to it, but overdoing your weekly tuna consumption may not be a good idea. I know that especially many bodybuilders like their tuna as an affordable and low-fat protein source and some consume it daily. That indeed might be a bit too much and you may want to ease up on the tuna a bit and consider other cheap protein sources. Pictures courtesy of “dutchgrub” and the NOAA. Never understood the fascination with tuna. Take the humble non-canned sardine. Dirt cheap, ridiculously easy to prepare (5 minutes? ), filled with omega 3s, mercury free as it can be and, as far as I know, 100% dolphin safe, LOL. Last week I just beat my personal record which is now 1 kg / 5 days. I eat a 130g can everyday. Am i gonna die? You are unlikely to die, but you could suffer the described side effects. From what I’ve been reading, there is also variation per can. It’s indicated that a can can have much more mercury in it than the average. I like my sushi and get it once a week about; I’m thinking I’ll switch to a different fish. Yes. You might end up with a can that has a higher (or, for that matter, lower) dosis, which makes estimating how much mercury you really ingested difficult. Hi EC, at this website “http://www.howmuchfish.com/”, what are your thoughts on it? Behind that site is the “Center for Consumer Freedom”, a lobbying group sponsored by fast food, tobaccao, meat and alcohol companies. I checked their recommendation for albacore tuna for a 160 lbs person and they claim safe consumption would be 50 oz per week. Below that they claim that their data is from the EPA, FDA and USDA, but at least the EPA and FDA have much lower limits. In short, I wouldn’t trust that site. ^ Noted on that EC, thanks for digging that site. Glad to see that with my sardine binging I am still profoundly on the safe side. Chunk light is from a smaller fish so it’s safer than Albacore. I do not recommend eating tuna more than once or twice a week. Basically the smaller the fish, the lower on the food chain and the safer it is. I’m a coastal person of the pacific ocean, my father is a fisherman and imagining my diet without regular freshly fished seafood would be impossible. Precisely today I ate the most tender tuna slice. Coincidentally, my sister in law is a biochemist who is running a study on Mercury level on seafood for her master degree and has found Tuna to have lower mercury concentrations than other, more popular fish (coastal fish are generally more contaminated than high sea fish). Of course fish is not the only meat I eat but eating just one serving per week would be near impossible to me. Of course I’m kidding, you cracked me up with the Dancing tuna in TV, fish got the short end of the stick on charisma levels. evilcyber i eat a 60g can four times a week with my salad at work, i love tuna and must be addicted to it! am i going to die? AND if so what fish can i have instead? is a kipper ok? thanks for all your research by the way…. Heah Sarah, that seems a bit much. It’s unlikely that you are going to die from it, but you may experience the negative effects of elevated mercury concentrations. I’d say ease back on the tuna a bit and look at some other fish. The general rule is that the smaller the fish, the safer it is to eat. The smaller ones absorb less mercury due to them being so low in the food chain.